The dinoflagellates (Greek δῖνος dinos "whirling" and Latin flagellum "whip, scourge") are a classification subgroup of protista.They are a large group of flagellate eukaryotes that constitute the phylum Dinoflagellata. Most are marine plankton, but they also are common in freshwater habitats. Their populations are distributed depending on sea surface temperature, salinity, or depth. Many dinoflagellates are known to be photosynthetic, but a large fraction of these are in fact mixotrophic, combining photosynthesis with ingestion of prey (phagotrophy). In terms of number of species, dinoflagellates are one of the largest groups of marine eukaryotes, although this group is substantially smaller than diatoms. Some species are endosymbionts of marine animals and play an important part in the biology of coral reefs. Other dinoflagellates are unpigmented predators on other protozoa, and a few forms are parasitic (for example, Oodinium and Pfiesteria). Some dinoflagellates produce resting stages, called dinoflagellate cysts or dinocysts, as part of their lifecycles. Dinoflagellates are considered to be protists, with their own division, Dinoflagellata. About 1,555 species of free-living marine dinoflagellates are currently described. Another estimate suggests about 2,000 living species, of which more than 1,700 are marine (free-living, as well as benthic) and about 220 are from fresh water. The latest estimates suggest a total of 2,294 living dinoflagellate species, which includes marine, freshwater, and parasitic dinoflagellates. 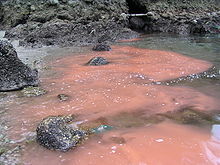 A bloom of certain dinoflagellates can result in a visible coloration of the water colloquially known as red tide, which can cause shellfish poisoning if humans eat contaminated shellfish. Some dinoflagellates also exhibit bioluminescence—primarily emitting blue-green light. 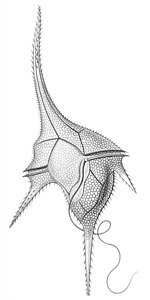 In 1753, the first modern dinoflagellates were described by Henry Baker as "Animalcules which cause the Sparkling Light in Sea Water", and named by Otto Friedrich Müller in 1773. The term derives from the Greek word δῖνος (dinos), meaning whirling, and Latin flagellum, a diminutive term for a whip or scourge. In the 1830s, the German microscopist Christian Gottfried Ehrenberg examined many water and plankton samples and proposed several dinoflagellate genera that are still used today including Peridinium, Prorocentrum, and Dinophysis. These same dinoflagellates were first defined by Otto Bütschli in 1885 as the flagellate order Dinoflagellida. Botanists treated them as a division of algae, named Pyrrophyta or Pyrrhophyta ("fire algae"; Greek pyrr(h)os, fire) after the bioluminescent forms, or Dinophyta. At various times, the cryptomonads, ebriids, and ellobiopsids have been included here, but only the last are now considered close relatives. Dinoflagellates have a known ability to transform from noncyst to cyst-forming strategies, which makes recreating their evolutionary history extremely difficult. Dinoflagellates are unicellular and possess two dissimilar flagella arising from the ventral cell side (dinokont flagellation). They have a ribbon-like transverse flagellum with multiple waves that beats to the cell's left, and a more conventional one, the longitudinal flagellum, that beats posteriorly. The transverse flagellum is a wavy ribbon in which only the outer edge undulates from base to tip, due to the action of the axoneme which runs along it. The axonemal edge has simple hairs that can be of varying lengths. The flagellar movement produces forward propulsion and also a turning force. The longitudinal flagellum is relatively conventional in appearance, with few or no hairs. It beats with only one or two periods to its wave. The flagella lie in surface grooves: the transverse one in the cingulum and the longitudinal one in the sulcus, although its distal portion projects freely behind the cell. In dinoflagellate species with desmokont flagellation (e.g., Prorocentrum), the two flagella are differentiated as in dinokonts, but they are not associated with grooves. Dinoflagellates have a complex cell covering called an amphiesma or cortex, composed of a series of membranes, flattened vesicles called alveolae (= amphiesmal vesicles) and related structures. In armoured dinoflagellates, these support overlapping cellulose plates to create a sort of armor called the theca, as opposed to athecate dinoflagellates. These occur in various shapes and arrangements, depending on the species and sometimes on the stage of the dinoflagellate. Conventionally, the term tabulation has been used to refer to this arrangement of thecal plates. The plate configuration can be denoted with the plate formula or tabulation formula. Fibrous extrusomes are also found in many forms. Together with various other structural and genetic details, this organization indicates a close relationship between the dinoflagellates, the Apicomplexa, and ciliates, collectively referred to as the alveolates. Dinoflagellate tabulations can be grouped into six "tabulation types": gymnodinoid, suessoid, gonyaulacoid–peridinioid, nannoceratopsioid, dinophysioid, and prorocentroid. The chloroplasts in most photosynthetic dinoflagellates are bound by three membranes, suggesting they were probably derived from some ingested algae. Most photosynthetic species contain chlorophylls a and c2, the carotenoid beta-carotene, and a group of xanthophylls that appears to be unique to dinoflagellates, typically peridinin, dinoxanthin, and diadinoxanthin. These pigments give many dinoflagellates their typical golden brown color. However, the dinoflagellates Karenia brevis, Karenia mikimotoi, and Karlodinium micrum have acquired other pigments through endosymbiosis, including fucoxanthin. This suggests their chloroplasts were incorporated by several endosymbiotic events involving already colored or secondarily colorless forms. The discovery of plastids in the Apicomplexa has led some to suggest they were inherited from an ancestor common to the two groups, but none of the more basal lines has them. All the same, the dinoflagellate cell consists of the more common organelles such as rough and smooth endoplasmic reticulum, Golgi apparatus, mitochondria, lipid and starch grains, and food vacuoles. Some have even been found with a light-sensitive organelle, the eyespot or stigma, or a larger nucleus containing a prominent nucleolus. The dinoflagellate Erythropsidium has the smallest known eye. Some athecate species have an internal skeleton consisting of two star-like siliceous elements that has an unknown function, and can be found as microfossils. 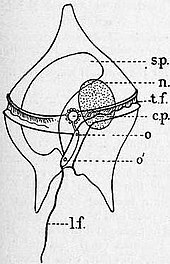 Tappan gave a survey of dinoflagellates with internal skeletons. This included the first detailed description of the pentasters in Actiniscus pentasterias, based on scanning electron microscopy. They are placed within the order Gymnodiniales, suborder Actiniscineae. The formation of thecal plates has been studied in detail through ultrastructural studies. 'Core dinoflagellates' (dinokaryotes) have a peculiar form of nucleus, called a dinokaryon, in which the chromosomes are attached to the nuclear membrane. These carry reduced number of histones. In place of histones, dinoflagellate nuclei contain a novel, dominant family of nuclear proteins that appear to be of viral origin, thus are called dinoflagellate/ viral nucleoproteins (DVNPs) which are highly basic, bind DNA with similar affinity to histones, and occur in multiple posttranslationally modified forms. Dinoflagellate nuclei remain condensed throughout interphase rather than just during mitosis, which is closed and involves a uniquely extranuclear mitotic spindle. This sort of nucleus was once considered to be an intermediate between the nucleoid region of prokaryotes and the true nuclei of eukaryotes, so were termed mesokaryotic, but now are considered advanced rather than primitive traits. In addition to dinokaryotes, DVNPs can be found in a group of basal dinoflagellates (known as Marine Alveolates, "MALVs") that branch as sister to dinokaryotes (Syndiniales). Dinoflagellates are protists which have been classified using both the International Code of Botanical Nomenclature (ICBN, now renamed as ICN) and the International Code of Zoological Nomenclature (ICZN). About half of living dinoflagellate species are autotrophs possessing chloroplasts and half are nonphotosynthesising heterotrophs. Most (but not all) dinoflagellates have a dinokaryon, described below (see: Life cycle, below). Dinoflagellates with a dinokaryon are classified under Dinokaryota, while dinoflagellates without a dinokaryon are classified under Syndiniales. Although classified as eukaryotes, the dinoflagellate nuclei are not characteristically eukaryotic, as some of them lack histones and nucleosomes, and maintain continually condensed chromosomes during mitosis. The dinoflagellate nucleus was termed ‘mesokaryotic’ by Dodge (1966), due to its possession of intermediate characteristics between the coiled DNA areas of prokaryotic bacteria and the well-defined eukaryotic nucleus. This group, however, does contain typically eukaryotic organelles, such as Golgi bodies, mitochondria, and chloroplasts. Jakob Schiller (1931–1937) provided a description of all the species, both marine and freshwater, known at that time. Later, Alain Sournia (1973, 1978, 1982, 1990, 1993) listed the new taxonomic entries published after Schiller (1931–1937). 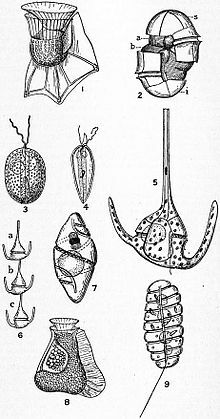 Sournia (1986) gave descriptions and illustrations of the marine genera of dinoflagellates, excluding information at the species level. The latest index is written by Gómez. English-language taxonomic monographs covering large numbers of species are published for the Gulf of Mexico, the Indian Ocean, the British Isles, the Mediterranean and the North Sea. The main source for identification of freshwater dinoflagellates is the Süsswasser Flora. Calcofluor-white can be used to stain thecal plates in armoured dinoflagellates. Dinoflagellates can occur in all aquatic environments: marine, brackish, and fresh water, including in snow or ice. They are also common in benthic environments and sea ice. All Zooxanthellae are dinoflagellates and most of them are members within the genus Symbiodinium. The association between Symbiodinium and reef-building corals is widely known. However, endosymbiontic Zooxanthellae inhabit a great number of other invertebrates and protists, for example many sea anemones, jellyfish, nudibranchs, the giant clam Tridacna, and several species of radiolarians and foraminiferans. Many extant dinoflagellates are parasites (here defined as organisms that eat their prey from the inside, i.e. endoparasites, or that remain attached to their prey for longer periods of time, i.e. ectoparasites). They can parasitize animal or protist hosts. Protoodinium, Crepidoodinium, Piscinoodinium, and Blastodinium retain their plastids while feeding on their zooplanktonic or fish hosts. In most parasitic dinoflagellates, the infective stage resembles a typical motile dinoflagellate cell. Three nutritional strategies are seen in dinoflagellates: phototrophy, mixotrophy, and heterotrophy. Phototrophs can be photoautotrophs or auxotrophs. Mixotrophic dinoflagellates are photosynthetically active, but are also heterotrophic. Facultative mixotrophs, in which autotrophy or heterotrophy is sufficient for nutrition, are classified as amphitrophic. If both forms are required, the organisms are mixotrophic sensu stricto. Some free-living dinoflagellates do not have chloroplasts, but host a phototrophic endosymbiont. A few dinoflagellates may use alien chloroplasts (cleptochloroplasts), obtained from food (kleptoplasty). Some dinoflagellates may feed on other organisms as predators or parasites. Food inclusions contain bacteria, bluegreen algae, small dinoflagellates, diatoms, ciliates, and other dinoflagellates. Mechanisms of capture and ingestion in dinoflagellates are quite diverse. Several dinoflagellates, both thecate (e.g. Ceratium hirundinella, Peridinium globulus) and nonthecate (e.g. Oxyrrhis marina, Gymnodinium sp. and Kofoidinium spp. ), draw prey to the sulcal region of the cell (either via water currents set up by the flagella or via pseudopodial extensions) and ingest the prey through the sulcus. In several Protoperidinium spp., e.g. P. conicum, a large feeding veil — a pseudopod called the pallium — is extruded to capture prey which is subsequently digested extracellularly (= pallium-feeding). Oblea, Zygabikodinium, and Diplopsalis are the only other dinoflagellate genera known to use this particular feeding mechanism). Katodinium (Gymnodinium) fungiforme, commonly found as a contaminant in algal or ciliate cultures, feeds by attaching to its prey and ingesting prey cytoplasm through an extensible peduncle. The feeding mechanisms of the oceanic dinoflagellates remain unknown, although pseudopodial extensions were observed in Podolampas bipes. Dinoflagellate blooms are generally unpredictable, short, with low species diversity, and with little species succession. The low species diversity can be due to multiple factors. One way a lack of diversity may occur in a bloom is through a reduction in predation and a decreased competition. The first may be achieved by having predators reject the dinoflagellate, by, for example, decreasing the amount of food it can eat. This additionally helps prevent a future increase in predation pressure by cause predators that reject it to lack the energy to breed. A species can then inhibit the growth of its competitors, thus achieving dominance. Dinoflagellates sometimes bloom in concentrations of more than a million cells per millilitre. Under such circumstances, they can produce toxins (generally called dinotoxins) in quantities capable of killing fish and accumulating in filter feeders such as shellfish, which in turn may be passed on to people who eat them. This phenomenon is called a red tide, from the color the bloom imparts to the water. Some colorless dinoflagellates may also form toxic blooms, such as Pfiesteria. Some dinoflagellate blooms are not dangerous. 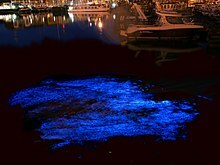 Bluish flickers visible in ocean water at night often come from blooms of bioluminescent dinoflagellates, which emit short flashes of light when disturbed. The same red tide mentioned above is more specifically produced when dinoflagellates are able to reproduce rapidly and copiously on account of the abundant nutrients in the water. Although the resulting red waves are an unusual sight, they contain toxins that not only affect all marine life in the ocean, but the people who consume them, as well. A specific carrier is shellfish. This can introduce both nonfatal and fatal illnesses. One such poison is saxitoxin, a powerful paralytic neurotoxin. Human inputs of phosphate further encourage these red tides, so strong interest exists in learning more about dinoflagellates, from both medical and economic perspectives. The ecology of harmful algal blooms is extensively studied. At night, water can have an appearance of sparkling light due to the bioluminescence of dinoflagellates. More than 18 genera of dinoflagellates are bioluminescent, and the majority of them emit a blue-green light. These species contain scintillons, individual cytoplasmic bodies (about 0.5 µm in diameter) distributed mainly in the cortical region of the cell, outpockets of the main cell vacuole. They contain dinoflagellate luciferase, the main enzyme involved in dinoflagellate bioluminescence, and luciferin, a chlorophyll-derived tetrapyrrole ring that acts as the substrate to the light-producing reaction. The luminescence occurs as a brief (0.1 sec) blue flash (max 476 nm) when stimulated, usually by mechanical disturbance. Therefore, when mechanically stimulated—by boat, swimming, or waves, for example—a blue sparkling light can be seen emanating from the sea surface. Dinoflagellate bioluminescence is controlled by a circadian clock and only occurs at night. Luminescent and nonluminescent strains can occur in the same species. The number of scintillons is higher during night than during day, and breaks down during the end of the night, at the time of maximal bioluminescence. The luciferin-luciferase reaction responsible for the bioluminescence is pH sensitive. When the pH drops, luciferase changes its shape, allowing luciferin, more specifically tetrapyrrole, to bind. Dinoflagellates can use bioluminescence as a defense mechanism. They can startle their predators by their flashing light or they can ward off potential predators by an indirect effect such as the "burglar alarm". The bioluminescence attracts attention to the dinoflagellate and its attacker, making the predator more vulnerable to predation from higher trophic levels. Bioluminescent dinoflagellate ecosystem bays are among the rarest and most fragile, with the most famous ones being the Bioluminescent Bay in La Parguera, Lajas, Puerto Rico; Mosquito Bay in Vieques, Puerto Rico; and Las Cabezas de San Juan Reserva Natural Fajardo, Puerto Rico. Also, a bioluminescent lagoon is near Montego Bay, Jamaica, and bioluminescent harbors surround Castine, Maine. Within the United States, Central Florida is home to the Indian River Lagoon which is abundant with dinoflagellates in the summer and bioluminescent ctenophore in the winter. There are a total of 5 bioluminescence bays in the world and 3 of them are in Puerto Rico . Dinoflagellates produce characteristic lipids and sterols. One of these sterols is typical of dinoflagellates and is called dinosterol. Dinoflagellate theca can sink rapidly to the seafloor in marine snow. Dinoflagellates have a haplontic life cycle, with the possible exception of Noctiluca and its relatives. The life cycle usually involves asexual reproduction by means of mitosis, either through desmoschisis or eleuteroschisis. More complex life cycles occur, more particularly with parasitic dinoflagellates. Sexual reproduction also occurs, though this mode of reproduction is only known in a small percentage of dinoflagellates. This takes place by fusion of two individuals to form a zygote, which may remain mobile in typical dinoflagellate fashion and is then called a planozygote. This zygote may later form a resting stage or hypnozygote, which is called a dinoflagellate cyst or dinocyst. After (or before) germination of the cyst, the hatchling undergoes meiosis to produce new haploid cells. One of their most striking features is the large amount of cellular DNA that dinoflagellates contain. Most eukaryotic algae contain on average about 0.54 pg DNA/cell, whereas estimates of dinoflagellate DNA content range from 3–250 pg/cell, corresponding to roughly 3000–215 000 Mb (in comparison, the haploid human genome is 3180 Mb and hexaploid Triticum wheat is 16 000 Mb). Polyploidy or polyteny may account for this large cellular DNA content, but studies of DNA reassociation kinetics do not support this hypothesis. In addition to their disproportionately large genomes, dinoflagellate nuclei are unique in their morphology, regulation, and composition. The dinoflagellates share an unusual mitochondrial genome organisation with their relatives, the Apicomplexa. Both groups have very reduced mitochondrial genomes (around 6 kilobases (kb) in the Apicomplexa vs ~16kb for human mitochondria). The genes on the dinoflagellate genomes have undergone a number of reorganisations, including massive genome amplification and recombination which have resulted in multiple copies of each gene and gene fragments linked in numerous combinations. Loss of the standard stop codons, trans-splicing of mRNAs for the mRNA of cox3, and extensive RNA editing recoding of most genes has occurred. The reasons for this transformation are unknown. The DNA of the plastid in the peridinin-containing dinoflagellates is contained in a series of small circles. Each circle contains one or two polypeptide genes. The genes for these polypeptides are chloroplast-specific because their homologs from other photosynthetic eukaryotes are exclusively encoded in the chloroplast genome. Within each circle is a distinguishable 'core' region. Genes are always in the same orientation with respect to this core region. In terms of DNA barcoding, ITS sequences can be used to identify species, where a genetic distance of p≥0.04 can be used to delimit species. A recent study revealed a substantial proportion of dinoflagellate genes encode for unknown functions, and that these genes could be conserved and lineage-specific. Dinoflagellates are mainly represented as fossils by fossil dinocysts, which have a long geological record with lowest occurrences during the mid-Triassic, whilst geochemical markers suggest a presence to the Early Cambrian. Some evidence indicates dinosteroids in many Paleozoic and Precambrian rocks might be the product of ancestral dinoflagellates (protodinoflagellates). Molecular phylogenetics show that dinoflagellates are grouped with ciliates and apicomplexans (=Sporozoa) in a well-supported clade, the alveolates. The closest relatives to dinokaryotic dinoflagellates appear to be apicomplexans, Perkinsus, Parvilucifera, syndinians, and Oxyrrhis. Molecular phylogenies are similar to phylogenies based on morphology. The earliest stages of dinoflagellate evolution appear to be dominated by parasitic lineages, such as perkinsids and syndinians (e.g. Amoebophrya and Hematodinium). All dinoflagellates contain red algal plastids or remnant (nonphotosynthetic) organelles of red algal origin. The parasitic dinoflagellate Hematodinium however lacks a plastid entirely. Dinoflagellate evolution has been summarized into five principal organizational types: prorocentroid, dinophysoid, gonyaulacoid, peridinioid, and gymnodinoid. The transitions of marine species into fresh water have been infrequent events during the diversification of dinoflagellates and in most cases have not occurred recently, possibly as late as the Cretaceous. Recently, the "living fossil" Dapsilidinium pastielsii was found inhabiting the Indo-Pacific Warm Pool, which served as a refugium for thermophilic dinoflagellates. ^ Parfrey LW, Lahr DJ, Knoll AH, Katz LA (August 2011). "Estimating the timing of early eukaryotic diversification with multigene molecular clocks". Proceedings of the National Academy of Sciences of the United States of America. 108 (33): 13624–9. Bibcode:2011PNAS..10813624P. doi:10.1073/pnas.1110633108. PMC 3158185. PMID 21810989. ^ a b c Gómez F (2012). "A checklist and classification of living dinoflagellates (Dinoflagellata, Alveolata)" (PDF). CICIMAR Océanides. 27 (1): 65–140. Archived from the original (PDF) on 2013-11-27. ^ Stoecker DK (1999). "Mixotrophy among Dinoflagellates". The Journal of Eukaryotic Microbiology. 46 (4): 397–401. doi:10.1111/j.1550-7408.1999.tb04619.x. ^ Guiry MD (October 2012). "How many species of algae are there?". Journal of Phycology. 48 (5): 1057–63. doi:10.1111/j.1529-8817.2012.01222.x. PMID 27011267. ^ a b c Fensome RA, Taylor RJ, Norris G, Sarjeant WA, Wharton DI, Williams GL (1993). A classification of living and fossil dinoflagellates. Micropaleontology Special Publication. 7. Hanover PA: Sheridan Press. OCLC 263894965. ^ GÓMEZ F (2005). "A list of free-living dinoflagellate species in the world's oceans". Acta Botanica Croatica. 64 (1): 129–212. ^ Taylor FR, Hoppenrath M, Saldarriaga JF (February 2008). "Dinoflagellate diversity and distribution". Biodivers. Conserv. 17 (2): 407–418. doi:10.1007/s10531-007-9258-3. ^ Baker, M., 1753. Employment for the microscope. Dodsley, London, 403 pp. ^ Müller, O.F. 1773. Vermium terrestrium et fluviatilium, seu Animalium Infusoriorum, Helmithicorum et Testaceorum, non marinorum, succincta historia, vol. 1. Pars prima. p. 34, 135. Faber, Havniae, et Lipsiae 1773. ^ Ehrenberg C.G. (1832) Beiträge zur Kenntnis der Organisation der Infusorien und ihrer geographischer Verbreitung, besonders in Sibirien. — Abhandlungen der Königlichen Akademie der Wissenschaften zu Berlin. Aus dem Jahre 1830. Physikalische Abhandlungen 1830: 1-88, Pls 1-8. ^ Bütschli O. (1885) 3. Unterabtheilung (Ordnung) Dinoflagellata. – In: Dr. H.G. Bronn's Klassen und Ordnungen des Thier-Reichs, wissenschaftlich dargestellt in Wort und Bild. Erster Band Protozoa. – C.F. Winter'sche Verlagshandlung, Leipzig und Heidelberg. Pp. 906-1029; Pl. ^ Taylor FJR (March 1975). "Non-helical transverse flagella in dinoflagellates". Phycologia. 14: 45–7. doi:10.2216/i0031-8884-14-1-45.1. ^ Leblond PH, Taylor FJ (April 1976). "The propulsive mechanism of the dinoflagellate transverse flagellum reconsidered". Bio Systems. 8 (1): 33–9. doi:10.1016/0303-2647(76)90005-8. PMID 986199. ^ Gaines G, Taylor FJ (May 1985). "Form and function of the dinoflagellate transverse flagellum". J. Protozool. 32 (2): 290–6. doi:10.1111/j.1550-7408.1985.tb03053.x. ^ Morrill LC, Loeblich AR (1983). Ultrastructure of the dinoflagellate amphiesma. International Review of Cytology. 82. pp. 151–80. doi:10.1016/s0074-7696(08)60825-6. ISBN 9780123644824. PMID 6684652. ^ Cavalier-Smith T (1991). "Cell diversification in heterotrophic flagellates". In Patterson D, Larsen J (eds.). The biology of free-living heterotrophic flagellates. Systematics Association Publications. 45. Clarendon Press. pp. 113–131. ISBN 978-0198577478. ^ Hackett JD, Anderson DM, Erdner DL, Bhattacharya D (October 2004). "Dinoflagellates: a remarkable evolutionary experiment". American Journal of Botany. 91 (10): 1523–34. doi:10.3732/ajb.91.10.1523. PMID 21652307. ^ Schwab IR (September 2004). "You are what you eat". The British Journal of Ophthalmology. 88 (9): 1113. doi:10.1136/bjo.2004.049510. PMC 1772300. PMID 15352316. ^ Tappan H (1980). The Paleobiology of Plant Protists. Geology. W.H. Freeman. ISBN 978-0716711094. ^ Gornik SG, Ford KL, Mulhern TD, Bacic A, McFadden GI, Waller RF (December 2012). "Loss of nucleosomal DNA condensation coincides with appearance of a novel nuclear protein in dinoflagellates". Current Biology. 22 (24): 2303–12. doi:10.1016/j.cub.2012.10.036. PMID 23159597. ^ Strassert JF, Karnkowska A, Hehenberger E, Del Campo J, Kolisko M, Okamoto N, Burki F, Janouškovec J, Poirier C, Leonard G, Hallam SJ, Richards TA, Worden AZ, Santoro AE, Keeling PJ (January 2018). "Single cell genomics of uncultured marine alveolates shows paraphyly of basal dinoflagellates". The ISME Journal (Submitted manuscript). 12 (1): 304–308. doi:10.1038/ismej.2017.167. PMC 5739020. PMID 28994824. ^ Steidinger KA, Jangen K (1997). "Dinoflagellates". In Tomas CR (ed.). Identifying Marine Phytoplankton. Academic Press. pp. 387–584. ISBN 978-0-08-053442-8. ^ Schiller, J., 1931–1937: Dinoflagellatae (Peridinineae) in monographischer Behandlung. In: RABENHORST, L. (ed. ), Kryptogamen-Flora von Deutschland, Österreichs und der Schweiz. Akad. Verlag., Leipzig. Vol. 10 (3): Teil 1 (1–3) (1931–1933): Teil 2 (1–4)(1935–1937). ^ Sournia A (1973). "Catalogue des espèces et taxons infraspécifiques de dinoflagellés marins actuels publiés depuis la révision de J. Schiller. I. Dinoflagellés libres". Beih. Nova Hedwigia. 48: 1–92. ^ Sournia A (1978). "Catalogue des espèces et taxons infraspécifiques de dinoflagellésmarins actuels publiés depuis la révision de J. Schiller. III (Complément)". Rev. Algol. 13: 3–40 +erratum 13, 186. ^ Sournia A (1982). "Catalogue des espèces et taxons infraspécifiques de dinoflagellésmarins actuels publiés depuis la révision de J. Schiller. IV. (Complément)". Arch. Protistenkd. 126 (2): 151–168. doi:10.1016/S0003-9365(82)80046-8. ^ Sournia A (1990). "Catalogue des espèces et taxons infraspécifiques de dinoflagellésmarins actuels publiés depuis la révision de J. Schiller. V. (Complément)". Acta Protozool. 29: 321–346. ISSN 0065-1583. ^ Sournia A (1993). "Catalogue des espèces et taxons infraspécifiques de dinoflagellésmarins actuels publiés depuis la révision de J. Schiller. VI. (Complément)". Cryptog. Algol. 14: 133–144. ISSN 0181-1568. ^ SOURNIA, A., 1986: Atlas du Phytoplancton Marin. Vol. I: Introduction, Cyanophycées,Dictyochophycées, Dinophycées et Raphidophycées. Editions du CNRS, Paris. ^ Steidinger KA, Williams J (1970). Dinoflagellates. Memoirs of the Hourglass Cruises. 2. Florida: Marine Research Laboratory. OCLC 6206528. ^ Taylor F (1976). Dinoflagellates from the International Indian Ocean Expedition: A Report on Material Collected by the R.V. "Anton Bruun" 1963–1964. Biblioteca Botanica. 132. E. Schweizerbart. ISBN 978-3510480036. OCLC 3026853. ^ Dodge, J. D. 1982. Marine Dinoflagellates of the British Isles. Her Majesty's Stationery Office, London. ^ Gómez F (April 2003). "Checklist of Mediterranean free-living dinoflagellates". Botanica Marina. 46 (3): 215–242. doi:10.1515/BOT.2003.021. ^ Hoppenrath M, Elbrächter M, Drebes G (2009). Marine phytoplankton: selected microphytoplankton species from the North Sea around Helgoland and Sylt. Stuttgart: E. Schweizerbart'sche Verlagsbuchhandlung (Nägele und Obermiller). ISBN 978-3-510-61392-2. ^ Popovský J, Pfiester LA (1990). Dinophyceae (Dinoflagellida). Süßwasserflora von Mitteleuropa. 6. Fischer. ISBN 978-3334002476. ^ Fritz L, Triemer R (December 1985). "A rapid simple technique utilizing calcofluor white M2R for the visualization of dinoflagellate thecal plates". J. Phycol. 21 (4): 662–4. doi:10.1111/j.0022-3646.1985.00662.x. ^ Trench R (1997). "Diversity of symbiotic dinoflagellates and the evolution of microalgal-invertebrate symbioses". In Lessios H, MacIntyre I (eds.). Proceedings of the eighth International Coral Reef Symposium, Panama, June 24–29, 1996. 2. Balboa, Panama: Smithsonian Tropical Research Institute. pp. 1275–86. OCLC 833272061. ^ Schnepf E, Elbrächter M (February 1992). "Nutritional strategies in dinoflagellates: A review with emphasis on cell biological aspects". European Journal of Protistology. 28 (1): 3–24. doi:10.1016/S0932-4739(11)80315-9. PMID 23194978. ^ Kofoid CA, Swezy O (1921). "The free-living unarmoured dinoflagellata". Mere. Univ. Calif. 5: 1–538. doi:10.5962/bhl.title.24995. ^ a b Barker HA (1935). "The culture and physiology of the marine dinoflagellates". Arch. Mikrobiol. 6 (1–5): 157–181. doi:10.1007/BF00407285. ^ Biecheler B (1952). "Recherches sur les Peridiniens". Bull. Biol. Fr. Belg. 36 (Suppl): 1–149. ^ a b Bursa AS (1961). "The annual oceanographic cycle at Igloolik in the Canadian Arctic. II. The phytoplankton". J. Fish. Res. Bd Can. 18 (4): 563–615. doi:10.1139/f61-046. ^ Norris DR (1969). "Possible phagotrophic feeding in Ceratium lunula Schimper" (PDF). Limnol. Oceanogr. 14 (3): 448–9. Bibcode:1969LimOc..14..448N. doi:10.4319/lo.1969.14.3.0448. ^ a b Dodge JD, Crawford RM (June 1970). "The morphology and fine structure of Ceratium hirundinella (Dinophyceae)". J. Phycol. 6 (2): 137–149. doi:10.1111/j.1529-8817.1970.tb02372.x. ^ Elbrachter M (1979). "On the taxonomy of unarmored dinophytes (Dinophyta) from the Northwest African upwelling region". Meteor Forschungsergebnisse. 30: 1–22. ^ Frey LC, Stoermer EF (1980). "Dinoflagellate phagotrophy in the upper Great Lakes". Trans. Am. Microsc. Soc. 99 (4): 439–444. doi:10.2307/3225654. JSTOR 3225654. ^ Cachon PJ, Cachon M. ": Le systeme stomatopharyngien de Kofoidinium Pavillard. Comparisons avec celui divers Peridiniens fibres et parasites". Protistologica. 10: 217–222. ^ Gaines G, Taylor FJ (1984). "Extracellular digestion in marine dinoflagellates". J. Plankton Res. 6 (6): 1057–61. doi:10.1093/plankt/6.6.1057. ^ a b Jacobson DM, Anderson DM (September 1986). "Thecate heterotrophic dinoflagellates: feeding behavior and mechanisms". J. Phycol. 22 (3): 249–258. doi:10.1111/j.1529-8817.1986.tb00021.x. ^ Strom SL, Buskey EJ (1993). "Feeding, growth, and behavior of the thecate heterotrophic dinoflagellate Oblea rotunda" (PDF). Limnol. Oceanogr. 38 (5): 965–977. Bibcode:1993LimOc..38..965S. doi:10.4319/lo.1993.38.5.0965. ^ Naustvoll LJ (January 1998). "Growth and grazing by the thecate heterotrophic dinoflagellates Diplopsalis lenticula (Diplopsalidaceae, Dinophyceae)". Phycologia. 37 (1): 1–9. doi:10.2216/i0031-8884-37-1-1.1. ^ Spero HJ (September 1982). "Phagotrophy in Gymnodinium fungiforme (Pyrrophyta): the peduncle as an organelle of ingestion". J. Phycol. 18 (3): 356–360. doi:10.1111/j.1529-8817.1982.tb03196.x. ^ Schütt F (1895). "2. Teil, Studien iiber die Zellen der Peridineen". Die Peridineen der Plankton-Expedition. Ergebnisse der Plankton-Expedition der Humboldt-Stiftung. Allgemeiner Theil. pp. 1–170. OCLC 69377189. ^ Smayda, Theodore J. (2002). "Adaptive ecology, growth strategies and the global bloom expansion of dinoflagellates". Journal of Oceanography. 58 (2): 281–294. doi:10.1023/A:1015861725470. ISSN 0916-8370. ^ Huntley, M. E.; Sykes, P.; Rohan, S.; Marin, V. (1986). "Chemically-mediated rejection of dinoflagellate prey by the copepods Calanus pacificus and Paracalanus parvus: mechanism, occurrence and significance". Marine Ecology Progress Series. 28: 105–120. doi:10.3354/meps028105. ^ Faust M, Gulledge, R.A. (2002). Identifying Harmful Marine Dinoflagellates. Contributions from the United States National Herbarium. 42. Washington, D.C.: Department of Systematic Biology, Botany, National Museum of Natural History. ISSN 0097-1618. Retrieved 2007-05-18. ^ Granéli E, Turner JT (2007). Ecology of Harmful Algae. Ecological Studies. 189. Springer. ISBN 978-3-540-74009-4. ISSN 0070-8356. ^ Castro P, Huber ME (2010). Marine Biology (8th ed.). McGraw Hill. p. 95. ISBN 978-0071113021. ^ Hastings JW (1996). "Chemistries and colors of bioluminescent reactions: a review". Gene. 173 (1 Spec No): 5–11. doi:10.1016/0378-1119(95)00676-1. PMID 8707056. ^ Poupin, J., A.-S. Cussatlegras, and P. Geistdoerfer. 1999. Plancton marin bioluminescent. Rapport scientifique du Laboratoire d'Océanographie de l'École Navale LOEN, Brest, France, 83 pp. ^ a b c d Haddock SH, Moline MA, Case JF (1 October 2009). "Bioluminescence in the sea". Annual Review of Marine Science. 2: 443–93. Bibcode:2010ARMS....2..443H. doi:10.1146/annurev-marine-120308-081028. PMID 21141672. ^ Knaust R, Urbig T, Li L, Taylor W, Hastings JW (February 1998). "The circadian rhythm of bioluminescence in Pyrocystis is not due to differences in the amount of luciferase: a comparative study of three bioluminescent marine dinoflagellates". J. Phycol. 34 (1): 167–172. doi:10.1046/j.1529-8817.1998.340167.x. ^ Fritz L, Morse D, Hastings JW (February 1990). "The circadian bioluminescence rhythm of Gonyaulax is related to daily variations in the number of light-emitting organelles". Journal of Cell Science. 95 ( Pt 2) (Pt 2): 321–8. PMID 2196272. ^ Dybas CL (May 2012). "Bright Microbes — Scientists uncover new clues to bioluminescence". Scientific American. 360 (5): 19. Bibcode:2012SciAm.306e..19D. doi:10.1038/scientificamerican0512-19. ^ Castine Kayak (2015). "Castine Kayak Bioluminescent Bay Night Kayak Excursion". visitmaine.com. Retrieved 1 July 2015. ^ Kennedy Duckett, Maryellen (2015-02-10). "Florida by Water: Experience Bioluminescence". Retrieved 31 July 2018. ^ Alldredge AL, Passow U, Haddock SH (1998). "The characteristics and transparent exopolymer particle (TEP) content of marine snow formed from thecate dinoflagellates". J. Plankton Res. 20 (3): 393–406. doi:10.1093/plankt/20.3.393. ^ von Stosch HA (1973). "Observations on vegetative reproduction and sexual life cycles of two freshwater dinoflagellates, Gymnodinium pseudopalustre Schiller and Woloszynskia apiculata sp. nov". British Phycological Journal. 8 (2): 105–34. doi:10.1080/00071617300650141. ^ Pfiester, Anderson (1987). "Ch. 14". In Taylor F (ed.). The Biology of dinoflagellates. Botanical monographs. 21. Blackwell Scientific. ISBN 978-0632009152. ^ Jackson CJ, Gornik SG, Waller RF (2012). "The mitochondrial genome and transcriptome of the basal dinoflagellate Hematodinium sp. : character evolution within the highly derived mitochondrial genomes of dinoflagellates". Genome Biology and Evolution. 4 (1): 59–72. doi:10.1093/gbe/evr122. PMC 3268668. PMID 22113794. ^ Laatsch T, Zauner S, Stoebe-Maier B, Kowallik KV, Maier UG (July 2004). "Plastid-derived single gene minicircles of the dinoflagellate Ceratium horridum are localized in the nucleus". Molecular Biology and Evolution. 21 (7): 1318–22. doi:10.1093/molbev/msh127. PMID 15034134. ^ Stern RF, Andersen RA, Jameson I, Küpper FC, Coffroth MA, Vaulot D, Le Gall F, Véron B, Brand JJ, Skelton H, Kasai F, Lilly EL, Keeling PJ (2012). "Evaluating the ribosomal internal transcribed spacer (ITS) as a candidate dinoflagellate barcode marker". PLOS One. 7 (8): e42780. Bibcode:2012PLoSO...742780S. doi:10.1371/journal.pone.0042780. PMC 3420951. PMID 22916158. ^ Litaker RW, Vandersea MW, Kibler SR, Reece KS, Stokes NA, Lutzoni FM, Yonish BA, West MA, Black MN, Tester PA (April 2007). "Recognizing dinoflagellate species using ITS rDNA sequences". J. Phycol. 43 (2): 344–355. doi:10.1111/j.1529-8817.2007.00320.x. ^ Stephens, Timothy G.; Ragan, MA; Bhattacharya, D; Chan, CX (Nov 21, 2018). "Core genes in diverse dinoflagellate lineages include a wealth of conserved dark genes with unknown functions". Scientific Reports. 8 (1): 17175. doi:10.1038/s41598-018-35620-z. PMC 6249206. PMID 30464192. ^ MacRae RA, Fensome RA, Williams GL (1996). "Fossil dinoflagellate diversity, originations, and extinctions and their significance". Can. J. Bot. 74 (11): 1687–94. doi:10.1139/b96-205. ISSN 0008-4026. ^ Moldowan JM, Talyzina NM (August 1998). "Biogeochemical evidence for dinoflagellate ancestors in the early cambrian". Science. 281 (5380): 1168–70. Bibcode:1998Sci...281.1168M. doi:10.1126/science.281.5380.1168. PMID 9712575. ^ Moldowan JM, Dahl JE, Jacobson SR, Huizinga BJ, Fago FJ, Shetty R, Watt DS, Peters KE (February 1996). "Chemostratigraphic reconstruction of biofacies: molecular evidence linking cyst-forming dinoflagellates with Pre-Triassic ancestors". Geology. 24 (2): 159–162. Bibcode:1996Geo....24..159M. doi:10.1130/0091-7613(1996)024<0159:CROBME>2.3.CO;2. ^ Talyzina NM, Moldowan JM, Johannisson A, Fago FJ (January 2000). "Affinities of early Cambrian acritarchs studied by using microscopy, fluorescence flow cytometry and biomarkers". Rev. Palaeobot. Palynol. 108 (1–2): 37–53. doi:10.1016/S0034-6667(99)00032-9. ^ Saldarriaga J; Taylor MFJR; Cavalier-Smith T; Menden-Deuer S; Keeling PJ (2004). "Molecular data and the evolutionary history of dinoflagellates". Eur J Protistol. 40 (1): 85–111. doi:10.1016/j.ejop.2003.11.003. ^ Fensome RA, Saldarriaga JF, Taylor FJ (1999). "Dinoflagellate phylogeny revisited: reconciling morphological and molecular based phylogenies". Grana. 38 (2–3): 66–80. doi:10.1080/00173139908559216. ^ Gunderson JH, Goss SH, Coats DW (1999). "The phylogenetic position of Amoebophrya sp. infecting Gymnodinium sanguineum". The Journal of Eukaryotic Microbiology. 46 (2): 194–7. doi:10.1111/j.1550-7408.1999.tb04603.x. PMID 10361739. Gunderson JH, John SA, Boman WC, Coats DW (2002). "Multiple strains of the parasitic dinoflagellate Amoebophrya exist in Chesapeake Bay". The Journal of Eukaryotic Microbiology. 49 (6): 469–74. doi:10.1111/j.1550-7408.2002.tb00230.x. PMID 12503682. ^ López-García P, Rodríguez-Valera F, Pedrós-Alió C, Moreira D (February 2001). "Unexpected diversity of small eukaryotes in deep-sea Antarctic plankton". Nature. 409 (6820): 603–7. doi:10.1038/35054537. PMID 11214316. ^ Moon-van der Staay SY, De Wachter R, Vaulot D (February 2001). "Oceanic 18S rDNA sequences from picoplankton reveal unsuspected eukaryotic diversity". Nature. 409 (6820): 607–10. doi:10.1038/35054541. PMID 11214317. ^ Saldarriaga JF, Taylor FJ, Keeling PJ, Cavalier-Smith T (September 2001). "Dinoflagellate nuclear SSU rRNA phylogeny suggests multiple plastid losses and replacements". Journal of Molecular Evolution. 53 (3): 204–13. Bibcode:2001JMolE..53..204S. doi:10.1007/s002390010210. PMID 11523007. ^ Janouskovec J, Horák A, Oborník M, Lukes J, Keeling PJ (June 2010). "A common red algal origin of the apicomplexan, dinoflagellate, and heterokont plastids". Proceedings of the National Academy of Sciences of the United States of America. 107 (24): 10949–54. Bibcode:2010PNAS..10710949J. doi:10.1073/pnas.1003335107. PMC 2890776. PMID 20534454. ^ Gornik SG, Cassin AM, MacRae JI, Ramaprasad A, Rchiad Z, McConville MJ, Bacic A, McFadden GI, Pain A, Waller RF (May 2015). "Endosymbiosis undone by stepwise elimination of the plastid in a parasitic dinoflagellate". Proceedings of the National Academy of Sciences of the United States of America. 112 (18): 5767–72. Bibcode:2015PNAS..112.5767G. doi:10.1073/pnas.1423400112. PMC 4426444. PMID 25902514. ^ Taylor FJ (1980). "On dinoflagellate evolution". Bio Systems. 13 (1–2): 65–108. doi:10.1016/0303-2647(80)90006-4. PMID 7002229. ^ Logares R, Shalchian-Tabrizi K, Boltovskoy A, Rengefors K (December 2007). "Extensive dinoflagellate phylogenies indicate infrequent marine-freshwater transitions". Molecular Phylogenetics and Evolution. 45 (3): 887–903. doi:10.1016/j.ympev.2007.08.005. PMID 17928239. ^ Mertens KN, Takano Y, Head MJ, Matsuoka K (2014). "Living fossils in the Indo-Pacific warm pool: A refuge for thermophilic dinoflagellates during glaciations". Geology. 42 (6): 531–534. Bibcode:2014Geo....42..531M. doi:10.1130/G35456.1. Spector, D.L. (1984). Dinoflagellates. Academic Press. ISBN 978-0-323-13813-0. Taylor, F.J.R. (1987). The Biology of Dinoflagellates. Botanical monographs. 21. Blackwell Scientific. ISBN 978-0632009152. Wikimedia Commons has media related to Dinoflagellata. Judson O (5 January 2010). "A Tale of Two Flagella". New York Times.